Early reporting shows that hedge funds posted gains in all categories with Equity Long up 4.96% and Multi Strategy up a healthy 9.61%. The benchmark broad index markets also posted very good gains, ranging from up 8% to up 11%. This is all a welcome bounce from lows of more than 20% in many of the sectors, but still well off from the highs. Futures started the year on the downside, with the trend systems suffering the most, off 3.25%. Only interest rates seem to be trending as yields come back down following a more dovish posture by the Fed. The sharp drop in equities, followed by a rebound, is not a good scenario for most funds that have trends as a good part of their portfolio. Find this at the end of this report. We post new interviews and reference new articles each month. Although our daily equity portfolios were all profitable, they lag far behind the benchmark equity index markets. During the sharp stock decline the portfolios shift to more defensive stocks as well as reducing exposure. When price turn around, it takes time for the portfolios to rebuild their positions, looking for stocks that have done better in the sell-off, or stocks that are rebounding sufficiently to get long. Then there is the possibility that prices will not sustain the rally. Our best performance was in the Income Focus program, a conservative strategy that counts on interest income to offset higher yields. Given its profile, it exceeded expectations. In this case, lower yields produced good profits while keeping a low-risk profile. Major Equity ETFs. A welcome rebound for the major equity ETFs, although a long way still to go. NASDAQ is the strongest, with the Internet stocks, such as Facebook, leading the recovery after a nasty sell-off. 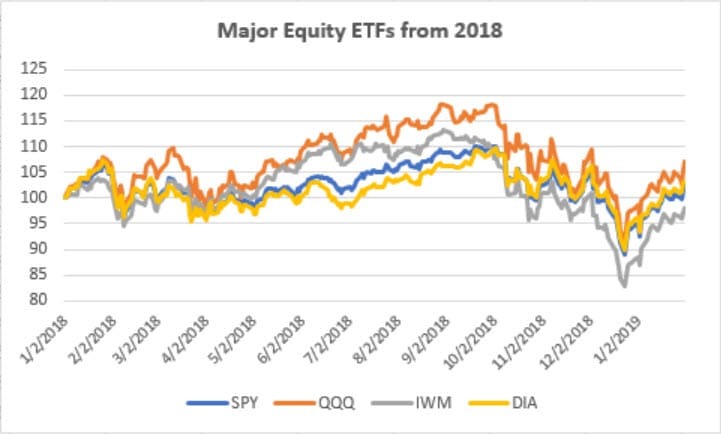 The small cap IWM is the weakest, below where it was at the beginning of 2018. CLOSE-UP: What can VIX tell us? The volatility index, VIX, can tell us a lot about the state of the market, and help make decisions that complement most strategies. It can also influence our market exposure and it can be traded as well. But the characteristics of VIX are very different from a normal price series, either stocks or futures. Figure 1 shows VIX on top, a 14-day stochastic of the VIX in the center, and SPY on the bottom, all starting in 2009. Figure 1. VIX-Stoch-SPY from 2009. VIX consistently peaks when SPY declines, although it may not be easy to see on the chart. Spikes in VIX over 25% always mark the end of a stock decline, even though VIX may continue to spike for another few days. While there are some traders that will buy VIX in anticipation of some economic announcement, most traders only sell the VIX after a rally. That turns out to be a profitable strategy. To see why this works, Table 1 summarizes the number of up days and down days for SPY, VIX, and UVXY (the tradable VIX ETF). While the SPY has 54% of the days moving higher, UVXY has 60% moving lower. For equities, the 54% shown by SPY is very close to what we all see as the upwards bias in stocks. The downward bias in VIX is easy to see in Figure 1 where the spikes are violent by short-lived. The pattern shows fast rallies and slow declines. Table 1. Summary of up days and down days for SPY, VIX, and UVXY. Another way of looking at the patterns in SPY and VIX is to create a table of runs. That is, “How many days in a row did prices go up? Down?” Table 2 summarizes all three markets. To find the pattern, we look for the “fat tail,” that is, the longest runs. For SPY we ignore the 1 and 2-day reversals and see that from 3 day runs and longer, the runs up far exceed the runs down. For example, there are 31 up runs of 6 days and only 6 down runs of 6 days. And, there is a run up of 14 days while the longest run down is 8 days. Trend following works because of these long runs. Table 2. Summary of Runs Up and Runs Down for SPY, VIX, and UVXY. For quants, it should be interesting that the long runs, the fat tail, get their values by having fewer runs of 1 and 2 than would occur with random data. We would like to show this as a bar chart, but the very long runs are too small to see. Looking at UVXY because it reflects actual trading, we see almost the opposite of SPY. The runs down far exceed the runs up. While we would only want to be long SPY, we would only want to be short UVXY after a rally. For short-term traders, buying SPY after a few days down can result in consistent profits. It takes advantage of the upwards bias and price noise. It is a mean-reversion strategy. VIX is the opposite. As prices fall, we want to sell. Because buying VIX is very risky, we wait for the decline to start, then have the advantage of the downside bias. It is a called a “high-momentum” strategy. For both buying SPY after a decline, and selling UVXY into a decline, we only hold the trades for 2 or 3 days. After that, price noise can work against you. Looking again at Figure 1, we see that spikes in VIX and overbought momentum in VIX are both good indicators of an upturn in SPY. It is similar to a volume spike. An outlier in both VIX or volume is consistently a good indication of a bottom in prices, albeit there is more risk because prices are moving quickly. VIX is a measure of volatility. When volatility is high, we want to reduce our exposure in the market. Because VIX is the volatility of an index, it represents the broad market and not an individual stock; therefore, to use it properly, we reduce our portfolio exposure in everything when VIX is high and increase exposure in everything when VIX is low. The professionals call this volatility stabilization. History shows that it may miss a little profit, but it reduces risk by much more. It’s a good trade-off. You can find the exact method for doing this in either of my books, Trading Systems and Methods, 5th Edition, or A Guide to Creating a Successful Algorithmic Trading Strategy. Or, you can try it yourself. It’s a good way to learn. One measure of market strength is our Trend Strength Index. Our Trend strategy is a composite of many trends, medium term to slow applied to about 275 stocks. When combined, these determine the position size of the current trade. If the faster trends are down but the slower one up, then the position size might be zero. The appearance is that trend positions scale in and out based on the strength of the trend. The Trend Strength Index appears at the bottom of the Trend Stocks All Signals report each day. We’ve tracked it from the beginning of 2014, and the chart below compares it with the SPY. TSI is the Trend Strength Index and SPY is the SPDR ETF. TSI values about zero indicate a positive trend. The range of the TSI is +1 to -1. The Trend Strength Index reflects the internal strength (momentum) of all the stocks that we track, about 275. These stocks tend to have a stronger trend than the typical stock. It is also a mix of stocks from the S&P and Nasdaq, with a few smaller caps, but none trading fewer than an average of 1 million shares per day. Last month’s chart showed the TSI at lows, but it is never good to buy when prices are falling quickly. As it turned out, there was only one more down day before the SPY started its recovery. The TSI started up on the same day, forming a bottom at the same level as the two earlier lows. The smaller recovery in the TSI compared to SPY indicates that the rally is weak, probably driven by fewer stocks and not a broad-based recovery at this point. From that we can expect another downturn before we see a bottoming formation. We offer this Index for those investors who select their own trades rather than following our sample portfolios. Daily Index values are available to subscribers. Note that the “All Signals” reports show short sales in stocks and ETFs, even though short positions are not executed in the portfolios. Our review of using inverse ETFs to hedge stocks during a decline showed that downturns in the stock market are most often short-lived and it is difficult to capture those moves with trend systems. This confirms our approach to the Timing systems, which hedges up to 50% of the long stock risk using multiple trends. In the long run, returns from the hedges are net losses; however, during 2008 the gains were welcomed and reduced losses. In any correction, we prefer paying for risk insurance, even without the expectation of a net gain. All the programs -- stocks, ETFs, and futures -- use the same basic portfolio technology. They all exploit the persistence of performance, that is, they seek those markets with good long-term and short-term returns, rank them, then choose the best, subject to liquidity, an existing current signal, with limitations on how many can be chosen from each sector. If there are not enough stocks or futures markets that satisfy all the conditions, then the portfolio holds fewer assets. In general, these portfolios are high beta, showing higher returns and higher risk, but have had a history of consistently out-performing the broad market index in all traditional measures. NOTE that the charts show below represent performance “tracking,” that is, the oldest results are simulated but the newer returns are the systematic daily performance added day by day. Any changes to the strategies do not affect the past performance, unless noted. The Trend program seeks long-term directional changes in markets and the portfolios choose stocks that have realized profitable performance over many years combined with good short-term returns. Small gains in the daily program and small losses in the weekly program underperformed the broad index markets. During a sharp downturn the program seeks stocks that have net positive returns, which we can call “defensive stocks.” They are often much less volatile than the high beta stocks that are usually in the portfolio. In turn, the portfolio takes longer to recover. Once other stocks show that they can sustain the new uptrend, the portfolio will switch back to more aggressive positions. The brightest spot in January was in Income Focus program, which gained nearly 3% in the daily program. With an objective of between 8% and 9% each year, that’s exceeds expectations. As yields decline in response to a more dovish Fed policy, this program gains in both direction and interest income. The weekly program was also profitable but less so because it does not show the last four days of the month. It should look better in the next report. 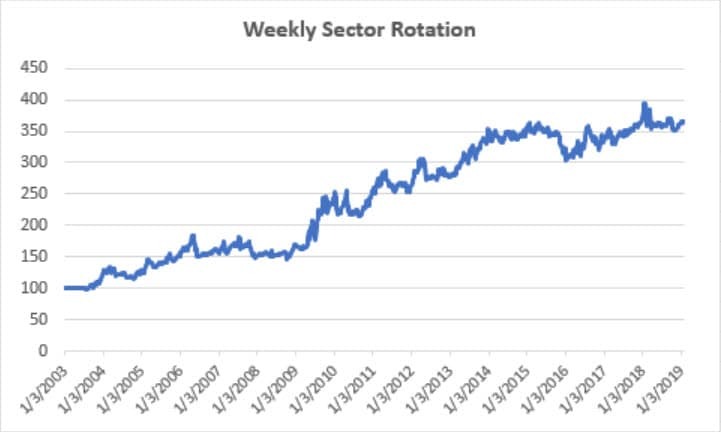 A small gain in the Sector Rotation program doesn’t reflect the four days during the last week of the month. Given some added profits, this program will look as though it’s ready to move higher. 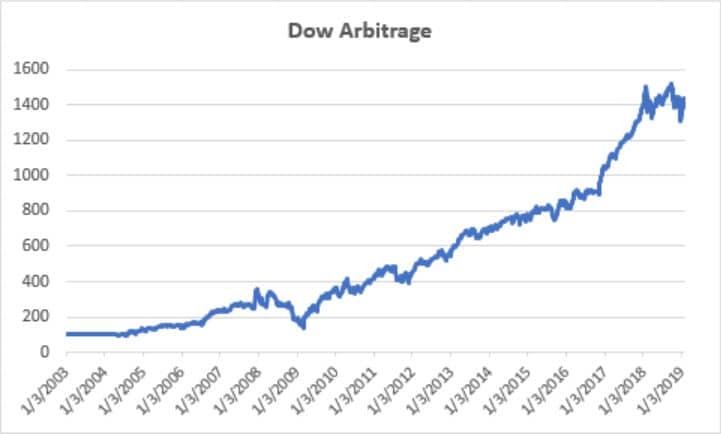 A 7% return in January shows as a nice recovery in the Dow Arbitrage program, and the best returns of any of the portfolios. This program continues to perform well. 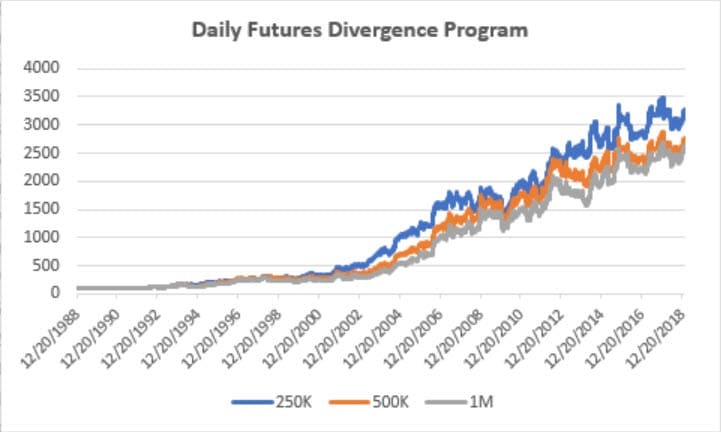 The Divergence program looks for patterns where price and momentum diverge, then takes a position in anticipation of the pattern resolving itself in a predictable direction, often the way prices had moved before the period of uncertainty. Gains of 4% and 2% in the 10 and 30-stock portfolio get this program off to a positive start for 2019. The larger portfolio continues to show much less volatility and a smaller decline during the recent bear market. 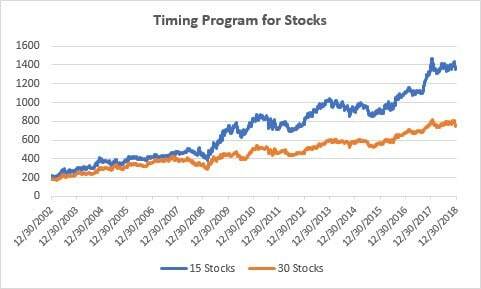 The Timing program is a relative-value arbitrage, taking advantage of undervalued stocks relative to its index. Its primary advantage is that it doesn’t depend on market direction for profits, although these portfolios are long-only because they are most often used in retirement accounts. When the broad market index turns down this program hedges part of the portfolio risk. The ETF Rotation program buys undervalued sectors, expecting them to outperform the other sectors over the short-term. The Timing Program buys undervalued stocks so that it will buy the weakest even in a declining market until that stock shows that it is not expected to rally. Risk is protected with an absolute stop of 15% and also by hedging the broad index. Although the Timing program only posted small gains in January, it was fully hedged for part of the month and is still 2/3 hedged. Despite the recent rally, most trends have not turned up; therefore, the hedge will come off slowly. Because of the hedge, this program shows little drawdown during the bear market. Futures allow both high leverage and true diversification. The larger portfolios, such as $1million, are diversified into both commodities and world index and interest rate markets, in addition to foreign exchange. Its performance is not expected to track the U.S. stock market and is a hedge in every sense because it is uncorrelated. As the portfolio becomes more diversified its returns are more stable. The leverage available in futures markets allows us to manage the risk in the portfolio, something not possible to the same degree with stocks. This portfolio targets 14% volatility. Investors interested in lower leverage can simply scale all positions equally in proportion to their volatility preference. Note that these portfolios do not trade Asian futures, which we believe are more difficult for U.S. investors to execute. Using the same strategy and portfolio logic, the Weekly Trend Program for Futures has the added smoothing resulting from looking only at Friday prices. While it will show a larger loss when the trend actually turns, most price moves are varying degrees of noise which this method can overlook. 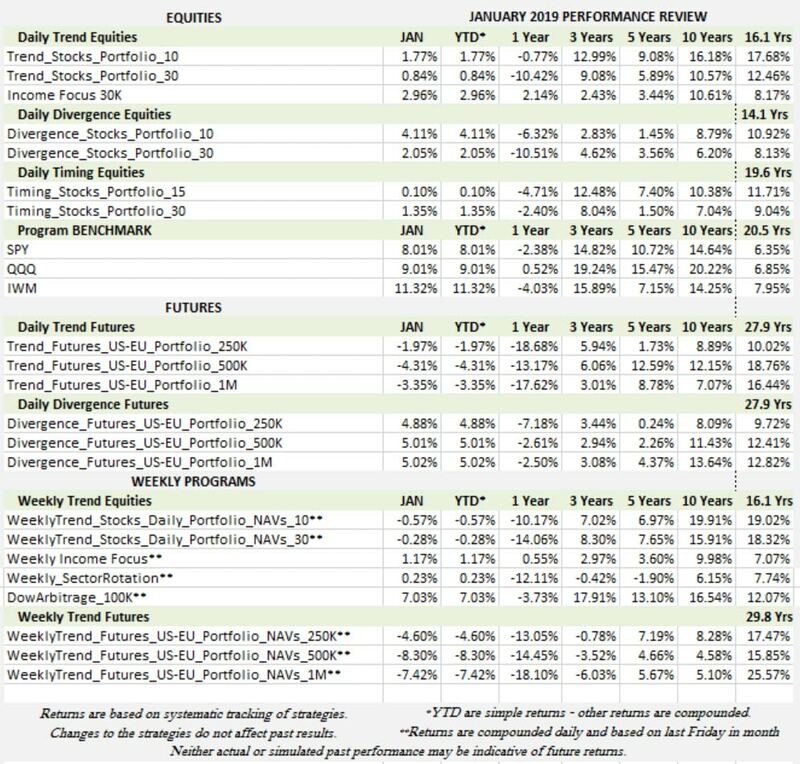 A disappointing start to futures trading this year, with both the daily and weekly trend programs posting losses. Gains were made in interest rate futures where the programs were long, but larger losses occurred in the equity index markets, which turned sharply from down to up, making it impossible for the strategy to capture a short-sale profit. Currencies also lacked any trend, with small moves in the euro and Brexit uncertainty causing the sterling to flop around. This program always pulls through, but we hope it will be due to an uptrend. 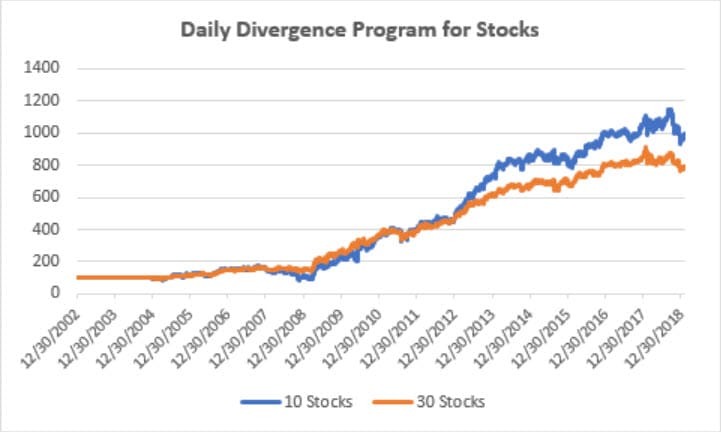 The Divergence program posted a nice move higher of about 5% in all portfolios for January. Given the volatility of this program, the gain keeps the returns in much the same pattern that we have seen for some time. The volatility of this program is due to having fewer position, waiting for a particular pattern to trigger a signal. We are in the process of a long overdue upgrade to our website. We will regroup our daily and weekly products, and add short-term strategies, and make it easier to navigate. Stay tuned. MetaStock will be offering a program with four of Mr. Kaufman’s short-term trading strategies for ETFs, stocks, and futures. They should be available now but are running late. Mr. Kaufman appears as a chapter in Mario Singh’s new book, Secret Conversations with Trading Tycoons, published by FXI International. Technical Analysis of Stocks & Commodities will publish “Volatility: What They Don’t Teach You In Grad School,” in the January edition. An article appeared in ProActive Investor Magazine looking at all calendar patterns, including the Santa Rally, the Presidential Cycle for 2019, the January and May effect, and seasonal patterns in ETFs. In January Technical Analysis of Stocks & Commodities will publish an article showing the real relationship between price and volatility, which will surprise you. It should change the way you size your positions. Mr. Kaufman spoke in Tokyo and Osaka to the Japanese association of Technical Analysts on various techniques for trading Japanese markets. You can contact the organization for a copy of the presentation. Mr. Kaufman was presented with a Japanese translation of his newest book, A Guide to Developing a Successful Trading Strategy. He also spoke about “Making Volatility Work for You” at the 2018 IFTA conference in Kuala Lumpur. It was an excellent conference with many good speakers. You may be able to get a copy of the presentation by contacting MATA, the Malaysian Technical Analysis organization. “In Search of the Best Trend” will appear in Technical Analysis of Stocks & Commodities this month. A new article on “Defense is Your Best Defense” will appear in ProActive Investor Magazine this week. He was interviewed by Jacek Lempart for his blog systemtrade.pl, serving the European Polish investors. The interview will be posted soon. A new interview with Mr Kaufman has been posted on the FXCM website (Forex Capital Markets) as of a few days ago. Mr. Kaufman spoke at the Trader’s Expo in New York on Monday, February 26th. His presentation was on ways to reduce risk that traders forget to use. Technical Analysis of Stocks & Commodities published Part 1 of a two-part article on profit-taking and resets, in their January issue. The first part looks at trend following and the second at short-term trading. Part 2 is scheduled for the February issue. Before that, they published “Optimization – Doing It Right,” in the September issue. Mr. Kaufman was a Keynote Speaker at the IFTA annual conference, hosted by the Swiss technical analyst’s association (SIAT) held in Milan, Italy, in October 12-16, 2017. A video of the presentation has been posted on the IFTA website. “Portfolio Risk in Uncertain Times” was just posted on Seeking Alpha. It shows a better way to structure your portfolio. Prior to this, you will find “Living Off Profits,” which shows how much you can safely withdraw from your account without seeing spiral down out of control. Before that Seeking Alpha published “What Are the Odds?” a look at how to assess the risk of loss for any investment. Modern Trader published “Dogging the Dow in the current edition, and a new article “Trading Opening Gaps” in stocks, scheduled for January 2018. The IFTA Journal published an interview with Mr Kaufman in the most recent quarterly issue. The broker FXCM posted a live interview with Mr Kaufman, taped on October 30. ProActive Investor Magazine published Keeping Risk Under Control on June 22. Check their website. It will be publishing other articles later this year. Andrew Swanscott at BetterSystemTrader.com (a good source for trading systems) has put up an edited version of an older presentation of Mr. Kaufman’s. It’s all about price noise and the Efficiency Ratio. Look for past articles by Mr. Kaufman on Seeking Alpha (www.seekingalpha.com), Forbes (http://www.forbes.com/sites/perrykaufman). www.equities.com, Modern Trader, Technical Analysis of Stocks & Commodities, and Proactive Advisor Magazine. You will also find many articles posted under Articles on our website, www.kaufmansignals.com. You can address any questions to perry@kaufmansignals.com. © January 2019, KaufmanSignals. All Rights Reserved.